In June 2017, 2016 – 2017 Big Boss Gary Ketchum officially passed the reins and title of the Silver Spurs Riding Club’s Big Boss to Dusty Holley. Each summer, the Silver Spurs Riding Club’s Board of Directors elects certain members to be a part of the “Bosses” and the “Law of the Range.” These men and women are elected to lead the club in sharing the tradition of rodeo sportsmanship and Osceola County’s ranching roots with the community. All of the Silver Spurs Riding Club members work 9 a.m. to 5 p.m. jobs on top of all their volunteer hours dedicated to the Club. As a liaison between the Club and community, some of Dusty’s Big Boss roles and responsibilities will include raising money for the Silver Spurs scholarship fund through two new exciting rodeo events in October 2017, along with two Silver Spurs Rodeos and a Monster Bulls performance in 2018. Along with Dusty Holley being elected Big Boss for the 2017 – 2018 year, Chris Fluke was appointed “Little Boss,” Chris Baker as “Straw Boss,” Robin Davis as “Old Bossy” and Sara Berlinsky as “Round-up Boss.” The Law of the Range for 2017 – 2018 consists of Steve Knowles, Gary Ketchum, Clifton Chapman, Jody Cox, Dustin Bronson and Justin Heaberlin. Each year, the Justin Cowboy Crisis Fund (JCCF) raises money for cowboys’ medical bills and to support their families during crises. Unfortunately, this past February, the Women’s Professional Rodeo Association (WPRA) and the rodeo community lost a champion barrel racer, Lara Dewees, in a barrel racing accident. 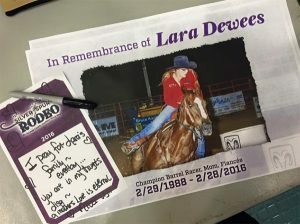 Because her family was left with medical and funeral-related expenses, the Professional Rodeo Cowboys Association (PRCA), JCCF, WPRA and many local rodeos came together to support them through this difficult time. During our past June rodeo performances, we were able to raise $175 to be donated to the Dewees family, and the Silver Spurs board of directors matched that amount, bringing the total to $350. Each summer, the Silver Spurs Riding Club’s Board of Directors elects certain Silver Spurs board members to be a part of the “Bosses” and the “Law of the Range”. These men and women are elected to lead the club in sharing the tradition of rodeo, sportsmanship, and Osceola’s ranching roots with the community. Jo Thacker, who served as “Big Boss” (similar to a chairman of the board or a board president), passed those responsibilities on to Gary Ketchum in July. His primary role as Big Boss is to be the liaison between the club and community. He’ll help lead the Silver Spurs Cowboy Classic golf tournament in October to raise funds for the club’s scholarship program, the Silver Spurs Rodeo events in February and June, and award scholarships to the winning recipients in April, among other things. Along with Gary Ketchum being elected Big Boss for this 2016 – 2017 year, Dusty Holley was appointed “Little Boss”, Chris Fluke was appointed “Straw Boss”, Robin Davis is “Old Bossy”, and RayeLynne Ketchum is “Roundup Boss”. The Law of the Range for 2016 – 2017 consists of Jodie Kidd, Clifton Chapman, Benny Sanderson, Chris Baker, Chris Fluke, Steve Knowles, and Jo Thacker. 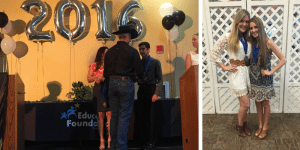 The Silver Spurs Riding Club awarded four local graduating seniors with $1,000 scholarships at the Education Foundation of Osceola County’s Annual Scholarship Awards event on April 27, 2016. 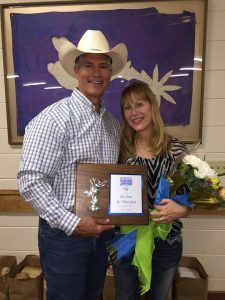 Silver Spurs’ “Little Boss” Gary Ketchum was there to present the awards to the recipients. Applications are due each year in February. The Silver Spurs’ Board of Directors then reviews the applications and selects the recipients. Applicants for this award must be residents of Osceola County, graduating seniors that have maintained at least a 2.5 grade point average, and have committed to attending college full-time during the fall semester after high school graduation. While the Silver Spurs Rodeo only happens a few times a year, the club’s efforts to give back to the community is a year-round passion. As the Silver Spurs Rodeo was founded in 1944 on horsemanship, talent, and friendship, the organization is currently made up of more than 300 volunteer-members. The rodeo events are put on year after year by the club’s volunteer-members to show Osceola County’s agricultural roots, meet up with old friends, and make memories. But as a 501(c)(5) non profit, the Silver Spurs Riding Club gives back to its community through providing scholarships to students and donating to other nonprofit groups in Osceola County. This rodeo season, the Silver Spurs Club focused on the children and families who need help in the community. 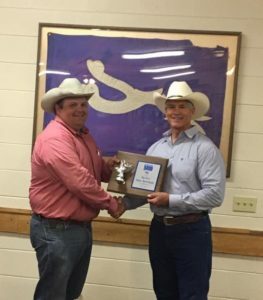 With the portions of the proceeds raised from the 136th Silver Spurs Rodeo, the organization was able to donate $5,000 to the Howard Phillips Center for Children and Families. The Howard Phillips Center provides dignity and healing for children, families and individuals who face overwhelming challenges like child abuse, sexual trauma, developmental disabilities, and lack of access to medical care. The Howard Phillips Center just extended its reach into Osceola County, offering a program called Healthy Families Osceola. This program is centered on preventing child abuse in families under stress on the verge of becoming destructive and abusive, with a 98% success rate of preventing child abuse by equipping these parents with the skills and resources to get back on track. Due to their success, the Silver Spurs organization is overjoyed to not only welcome the Howard Phillips Center to Osceola County but be able to fund their good work. The Silver Spurs Riding Club awarded four local graduating seniors with $1,000 scholarships at the Education Foundation of Osceola County’s Annual Scholarship Awards event on April 29. 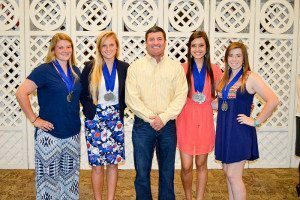 Silver Spurs’ “Big Boss” Tim Shirah was there to present the awards to the recipients. This year’s Silver Spurs recipients were Hannah Richards, St. Cloud High School; Taryn Howes, Harmony High School; Adalyn Gaston, Harmony High School; and Selena Clair, Harmony High School. Applicants for this award must be residents of Osceola County, graduating seniors that have maintained at least a 2.5 grade point average, and have committed to attending college full-time during the fall semester after high school graduation. The Silver Spurs Riding Club, a 501(c)(5) organization, raises money for its scholarship awards at the annual Silver Spurs Cowboy Classic golf tournament that takes place in October. “We are proud of our scholarship program. The Silver Spurs Riding Club is pleased to be able to help a handful of motivated students each year,” says Tim Shirah, the Spurs’ Big Boss. Applications are due in February. The Silver Spurs’ Board of Directors then reviews the applications and selects the recipients. 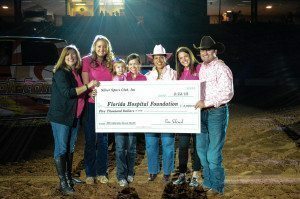 During Sunday’s February 22, 2015 performance of the Silver Spurs Rodeo, participants and attendees are asked to show their support for breast cancer research by wearing pink. A portion of the proceeds from Sunday’s event was donated to benefit cancer research, treatment and support at the Florida Hospital Foundation. The Tough Enough to Wear Pink organization has raised $20 million over the past 10 years for breast cancer research. This event was previously hosted on Friday night of the Rodeo but was changed to Sunday this year. 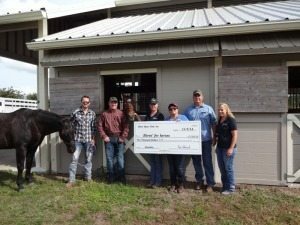 November 6, 2014 (Kissimmee, FL) – The Silver Spurs Riding Club and Heavenly Hoofs teamed up to raise money to support the “Heroes and Horses” program sponsored by Heavenly Hoofs. During the 133rd Silver Spurs Rodeo of Champions the crowd cheered and honored the Military veterans with a standing ovation as they rode their horses into the arena for the Grand Opening of the rodeo. 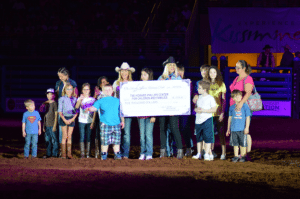 A dollar from every ticket sold during the rodeo in June was donated to Heroes and Horses program on November 5, 2014. Accepting the donation check, from left to right, is Veteran Eric Davidson, Silver Spurs Big Boss Tim Shirah, Equine Specialist Jay Cook, Veteran Sandra Sanchez, Veteran Steve Mollehauer and Equine Specialist Caity Wall. Heavenly Hoofs is a therapeutic center that partners with the McCormick Research Institute and UCF College of Medicine to identify ways horses can be used to heal the hearts of Veteran’s challenged by PTSD. Veterans participate in a ten-week group session that meets once a week for three hours. The group typically includes eight Veterans, an Equine professional, and a mental health therapist. The Silver Spurs Riding Club, a non-profit organization, is a volunteer based Osceola County tradition since 1942. Club members dedicate endless hours to the club’s events such as the bi-annual Silver Spurs Rodeo of Champions to promote good horsemanship and fellowship and to continue a lifelong tradition. For additional information on the Silver Spurs Rodeo of Champions, call (321) 697-3495. April 18, 2013 (Kissimmee, FL) – Volunteers for the Silver Spurs Riding Club spent a day fixing up a remodeled home for Habitat for Humanity of Osceola County. Interior painting, pool cleaning, porch screens repaired, interior fixtures fixed and an exterior clean-up were all in the days work for the club’s volunteers. “Not only were we honored to participate in providing a new home for a deserving family in Osceola County, but we also help revitalize and a neighborhood for our community,” said Big Boss for the Silver Spurs Club, Steve Knowles. About Habitat for Humanity of Osceola County – it is a faith based non-profit organization that enhances the lives of families and volunteers through the act of coming together to strengthen communities. They build homes and revitalize neighborhoods to provide Osceola County families with a strong base for a successful future. The Silver Spurs Riding Club, a non-profit organization, is a volunteer based Osceola County tradition since 1942. Club members dedicate endless hours to club events such as the bi-annual Silver Spurs Rodeo of Champions. Silver Spurs donates $1,700.00 to the Harmony High School FFA program.